The word "varnish" comes from Mediaeval Latin vernix, meaning odorous resin, itself derived from Middle Greek berōnikón or beroníkē, meaning amber or amber-colored glass. A false etymology traces the word to the Greek Berenice, the ancient name of modern Benghazi in Libya, where the first varnishes in the Mediterranean area were supposedly used and where resins from the trees of now-vanished forests were sold. Early varnishes were developed by mixing resin—pine sap, for example—with a solvent and applying them with a brush to get the golden and hardened effect one sees in today's varnishes. Varnishing was a technique well known in ancient Egypt. Varnishing is also recorded in the history of East and South Asia; in India, China and Japan, where the practice of lacquer work, a species of varnish application, was known at a very early date. The Tang Chinese used medieval chemistry experiments to produce a varnish for clothes and weapons, employing complex chemical formulas applied to silk clothes of underwater divers, a cream designated for polishing bronze mirrors, and many other useful formulas. Because of flammability concerns, many product containers list safety precautions for storage and disposal for varnishes and drying oils as they are flammable, and materials used to apply the varnishes may spontaneously combust. Many varnishes contain plant-derived oils (e.g. linseed oil), synthetic oils (e.g. polyurethanes) or resins as their binder in combination with organic solvents. These are highly flammable in their liquid state. A highly important note, that is often over looked, all drying oils, certain alkyds (including paints), and many polyurethanes produce heat (an exothermic reaction) during the curing process. Thus, oil-soaked rags and paper can smolder and ignite into flames, even several hours after use if proper precautions are not taken. Therefore, many manufacturers list proper disposal practices for rags and other items used to apply the finish, such as disposal in a water filled container. Varnish is traditionally a combination of a drying oil, a resin, and a thinner or solvent. However, different types of varnish have different components. After being applied, the film-forming substances in varnishes either harden directly, as soon as the solvent has fully evaporated, or harden after evaporation of the solvent through curing processes, primarily chemical reaction between oils and oxygen from the air (autoxidation) and chemical reactions between components of the varnish. Resin varnishes "dry" by evaporation of the solvent and harden almost immediately upon drying. Acrylic and waterborne varnishes "dry" upon evaporation of the water but will experience an extended curing period. Oil, polyurethane, and epoxy varnishes remain liquid even after evaporation of the solvent but quickly begin to cure, undergoing successive stages from liquid or syrupy, to tacky or sticky, to dry gummy, to "dry to the touch", to hard. Environmental factors such as heat and humidity play a very large role in the drying and curing times of varnishes. In classic varnish the cure rate depends on the type of oil used and, to some extent, on the ratio of oil to resin. The drying and curing time of all varnishes may be sped up by exposure to an energy source such as sunlight, ultraviolet light, or heat. There are many different types of drying oils, including linseed oil, tung oil, and walnut oil. These contain high levels of polyunsaturated fatty acids. Drying oils cure through an exothermic reaction between the polyunsaturated portion of the oil and oxygen from the air. Originally, the term "varnish" referred to finishes that were made entirely of resin dissolved in suitable solvents, either ethanol (alcohol) or turpentine. The advantage to finishes in previous centuries was that resin varnishes had a very rapid cure rate compared to oils; in most cases they are cured practically as soon as the solvent has fully evaporated. By contrast, untreated or "raw" oils may take weeks or months to cure, depending on ambient temperature and other environmental factors. In modern terms, "boiled" or partially polymerized drying oils with added siccatives or dryers (chemical catalysts) have cure times of less than 24 hours. However, certain non-toxic by-products of the curing process are emitted from the oil film even after it is dry to the touch and over a considerable period of time. It has long been a tradition to combine drying oils with resins to obtain favourable features of both substances. 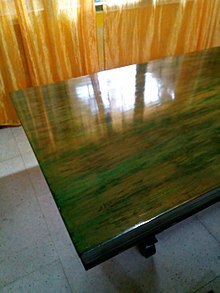 Many different kinds of resins may be used to create a varnish. Natural resins used for varnish include amber, kauri gum, dammar, copal, rosin (pine resin), sandarac, balsam, elemi, mastic, and shellac. Varnish may also be created from synthetic resins such as acrylic, alkyd, or polyurethane. A varnish formula might not contain any added resins at all since drying oils can produce a varnish effect by themselves. Originally, turpentine or alcohol was used to dissolve the resin and thin the drying oils. The invention of petroleum distillates has led to turpentine substitutes such as white spirit, paint thinner, and mineral spirit. Modern synthetic varnishes may be formulated with water instead of hydrocarbon solvents. Drying oil such as walnut oil or linseed oil may be used in combination with amber, copal, rosin or other resins. Traditionally the oil is prepared by cooking or exposure to air and sunlight, but modern "stand oil" is prepared by heating oil at high temperature without oxygen. The refined resin is sometimes available as a translucent solid and is then "run" by cooking or melting it in a pot over heat without solvents. The thickened oil and prepared resin are then cooked together and thinned with turpentine (away from open flame) into a brushable solution. The ingredients and processes of violin varnish are very diverse, with some highly regarded old examples showing defects (e.g. cracking, crazing) associated with incompatible varnish components. Modern commercially produced varnishes employ some form of alkyd for producing a protective film. Alkyds are chemically modified vegetable oils which operate well in a wide range of conditions and can be engineered to speed up the cure rate and thus harden faster. Better (and more expensive) exterior varnishes employ alkyds made from high performance oils and contain UV-absorbers; this improves gloss-retention and extends the lifetime of the finish. Various resins may also be combined with alkyds as part of the formula for typical "oil" varnishes that are commercially available. When first developed, no varnishes had good UV-resistance. Even after more modern synthetic resins did become resistant, a true spar varnish maintained its elasticity above other virtues, even if this required a compromise in its UV-resistance. Spar varnishes are thus not necessarily the best choice for outdoor woodwork that does not need to bend in service. Arguably, drying oils, such as linseed and tung oil, are not true varnishes though often in modern terms they accomplish the same thing. Unlike drying oils and alkyds which cure after evaporation of the solvent and upon reaction with oxygen from the air, true polyurethane coatings cure after evaporation of the solvent and then either by a variety of reactions of chemicals within the original mix, or by reaction with moisture from the air. Certain polyurethane products are "hybrids" and combine different aspects of their parent components. 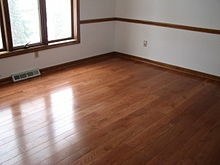 "Oil-modified" polyurethanes, whether water-borne or solvent-borne, are currently the most widely used wood floor finishes. Acrylic resin varnishes are typically water-borne varnishes with the lowest refractive index of all finishes and high transparency. They resist yellowing. Acrylics have the advantage of water clean-up and lack of solvent fumes, but typically do not penetrate into wood as well as oils. 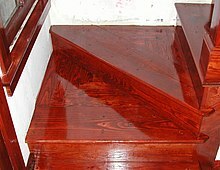 They sometimes lack the brushability and self-leveling qualities of solvent-based varnishes. Generally they have good UV-resistance. ^ "Make Your Own Oil/Varnish Blend". 8 May 2007. ^ "Finishing Solid Pine". www.johnsankey.ca. Look up varnish in Wiktionary, the free dictionary.